This recipe comes from the Oct 2005 ABC delicious magazine but they call it "aromatic chicken soup". 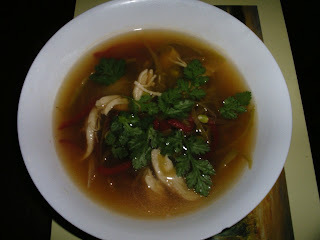 Place the chicken stock, lemongrass, ginger, eschalot, chilli and kaffir lime leaves in a saucepan, then bring to the boil. Add the chicken and poach for 5-10 minutes over medium heat. Remove the pan from the heat and allow the chicken to cool slightly in the broth. When cool enough to handle, remove the chicken and strain the broth, discarding solids. Return the stock to the saucepan. Shred the chicken into bite sized pieces. Add the lime juice and fish sauce to the stock and return to the boil. Add the shredded chicken and cook for a couple of minutes to reheat. Add the spring onions, snow peas and capsicum and allow the soup to return to the boil. Ladle into deep bowls and sprinkle with coriander. Serve immediately. Sounds great, I shall try this soon, the lime juice is different! I will make this on the weekend, with Bob's lemon grass from the meeting.